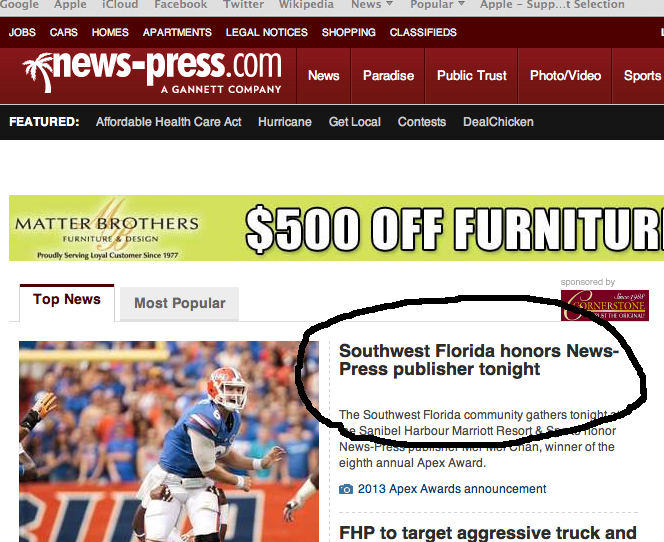 The top story on the homepage of The News-Press in Fort Myers is an advance -- an advance! -- for a chamber of commerce event tonight where Publisher Mei-Mei Chan will receive one of the group's annual Apex Awards for women. With 342 employees, the paper is ranked 35th on a list of Lee County's 100 major employers. Fort Myers is one of four papers to be redesigned early next month under the Butterfly Project test to include a new daily USA Today section of world and national news. The other dailies are in Appleton, Wisc., Indianapolis, and Rochester, N.Y.
One thing the list tells you: If you want a job, government and health care are the places to look. A big chunk of those employees actually work for GPS, so it'd be more accurate to say that Gannett ranks 35th. GPS is still Gannett, however. So no matter how you group them, according to the county, Gannett has 342 employees. Apparently this is one publisher that loves to have to foto and stories about her in the newspaper and online.I'm told she gets very, very upset if her photo is not in something the News-Press covered. Why single out this site? This is common throughout the community dailies -- putting stale news and non-news into the feature positions. Have a look around at the sites if you don't believe me. I single this site out because it's one of the four, as I noted, that will get the Butterfly Project treatment. 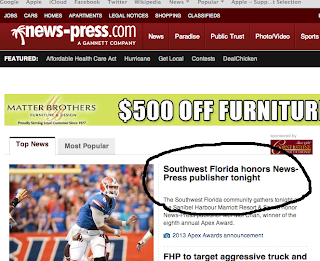 In the weeks and months ahead, I'll be paying much more attention to Fort Myers and the three other dailies. If you are paying close attention you would know Indy sold their building and employees are being moved to the local mall.